Our beliefs describe how we view God, Jesus, the Bible and many significant aspects of our faith. Firmly rooted in scripture, the beliefs of Brazos Fellowship guide our decisions as a church. We believe there exists only one living and true God who is revealed to us as Father, Son, and Holy Spirit. We believe the eternal Son of God was born of a virgin as fully God and fully man. He became a man in order to be the sinless sacrifice for humanity’s waywardness from God. He was put to death on a cross, was buried, and rose again on the third day of his death. He ascended to heaven and lives forevermore as the Savior of the world. He will one day return to earth with His followers, to reign over His Kingdom. We believe the Holy Spirit is a person who helps, comforts, convicts, and teaches. He is the supernatural agent who dwells in and seals the believer in Christ. His work is to reveal Christ, convict of sin, lead to repentance, guide believers, comfort, strengthen, and lead. We believe the Bible is God’s Word. It is the inspired Word of God, which is the final authority for faith and living. The Word of God is without error and entirely God breathed. It is by the Word of God that we can know and understand who God is. We believe that all of mankind is God’s special and loved creation. Man has not been created by chance or mistake, but intentionally in God’s image. Each person is valued and known by God. Every person has chosen to rebel against God, which the Bible calls sin, resulting in separation from Him. Our separation from God is an eternal division that is impossible to bridge without Christ. We believe God loved each person so much that he provided a way to remedy our eternal separation from Him. The solution is Jesus Christ. He is the only way to God. This connection is freely offered to each person. The free gift is through belief in Christ’s completed work on the cross and resurrection from the dead. This belief results in forgiveness of sin and following God’s leadership rather than our own. We believe the Body of Christ exists as a community of followers of Christ. The Church exists globally and locally. God has given the Church a mission to live in unity and spread the story of the transforming power of Jesus Christ. We believe baptism is an act of obedience shared in the context of the church to symbolize the change Jesus Christ has made in the new believer’s life. 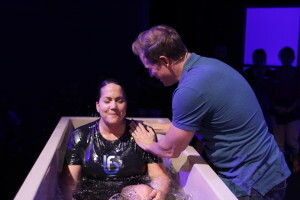 Baptism was modeled by Jesus for all believers to follow as a testimony to the world that He is their Savior and Lord. Baptism is by completely immersing the professing believer underwater. We believe the church is to share a meal of remembrance of Christ as a community. The meal is a symbol of the body and blood of Christ that was broken and spilled out in love and for the forgiveness of our sins.